I woke up at 6:30 this morning. I changed diapers, nursed a baby, made breakfast, dealt with tantrums, all before I had a chance to have that first sip of coffee. Then I went on to do three loads of laundry, clean the bathroom, make lunch, hold crabby kids, do nap time, tidy up the kitchen, etc, etc. I know how to give. That’s not my problem. I am constantly giving of myself to my family. I’m giving up my time, personal space, my sleep, and hobbies that I enjoy. Some days leave me so exhausted that feel like I have nothing left to give. But when I read today’s reading I realize that there’s something I’m still holding on to. You see, my giving is not very cheerful. In fact, my giving is usually accompanied by some loud sighing and eye rolling and occasionally some door slamming. My giving is not cheerful because I haven’t given all. There’s still a tiny part of my heart that I’m holding onto, fighting tooth and nail to keep control of it because if it I give it all, well, then I’d have to trust Him. And that would be terrifying. When I try to hold on to my life, people become annoyances, and my vocation becomes drudgery. 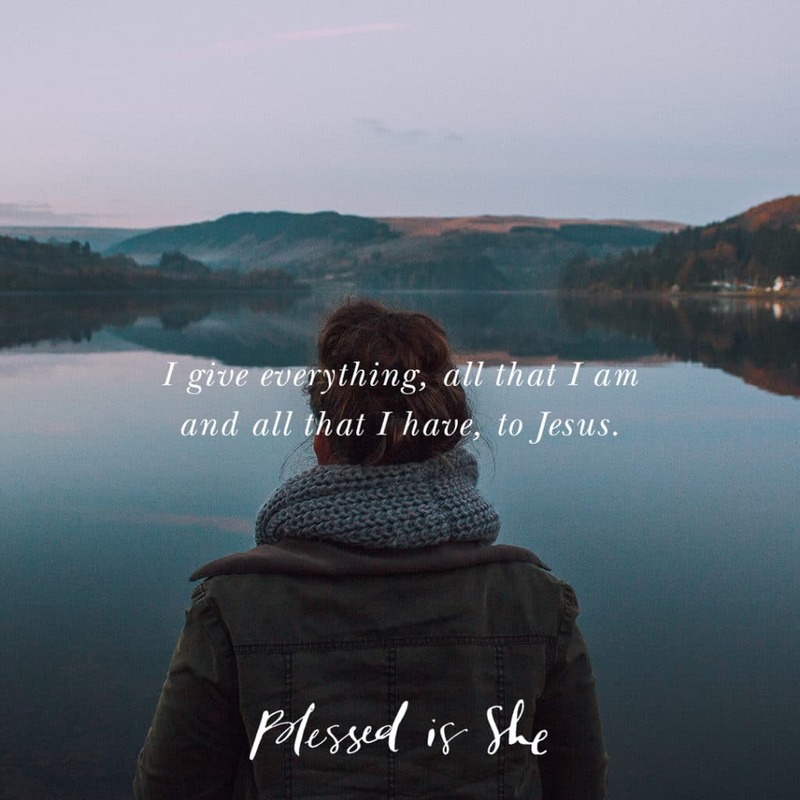 But when I give everything, all that I am and all that I have, to Jesus, He gives me grace in “abundance for every good work.” (2 Corinthians 9:8) It is because of this grace that I am able to cheerfully serve those around me. Sisters, don’t be afraid to be generous with God. God cannot be outdone in generosity. For whatever He may ask of us, in the workplace, at school, on the mission field, or at home with crabby toddlers, He’s always there, giving us the grace to get it done. The Lord is not satisfied with most of me, He wants all of me. Thank you! So encouraging and just the reminder I needed. Keep of the great work, Blessed Is She! Thank you so much for sharing your heart this morning. Reading the Scriptures I found myself thinking, ‘yeah, we could give more money to the church.’ But to apply those same scriptures to my vocation as a mother?! That’s a totally different ball game! Thanks for taking it that route and calling me out, Sister! Goodness, I literally woke up to my 4 year old trying to crawl into our bed at 5:30a while my 15 month old was stirring on the other side of me, fussy from teething all night – I was annoyed and not generous. I knew I needed to run to the Word before the day really started and these readings awaited me. And if the readings weren’t clear enough your devotion was the metaphorical cold water to the face wake up call I needed. Thank you sister for your openness to the Spirit. The Lord very clearly spoke to me through you this morning. I’m constantly telling my kids “There’s enough!”. There’s enough…Toys, food, love, etc. I need to remember too that there’s enough grace – I will hold on to what you said about not fearing to be generous to our Lord. Thank you for your honesty. Great reflection! It really spoke to me and I tried to put it into practice yesterday. I found a lot more peace in my day! Thank you.